Yesterday 12 people – the editor, cartoonists and other staff of the satirical weekly Charlie Hebdo, along with two policemen – were brutally murdered by terrorists. Charlie Hebdo’s earlier published islam-critic cartoons as well as recordings of „Allahu Akbar“ during the carnage, the attack was supposedly conducted by Islamic extremists. On the day of the deadly attack Charlie Hebdo published a cartoon of Michel Houellebecq, whose book „La Soumission“ (submission) – a dystopian novel where a sort of Muslim brotherhood takes over the French government in 2022 – was released recently. 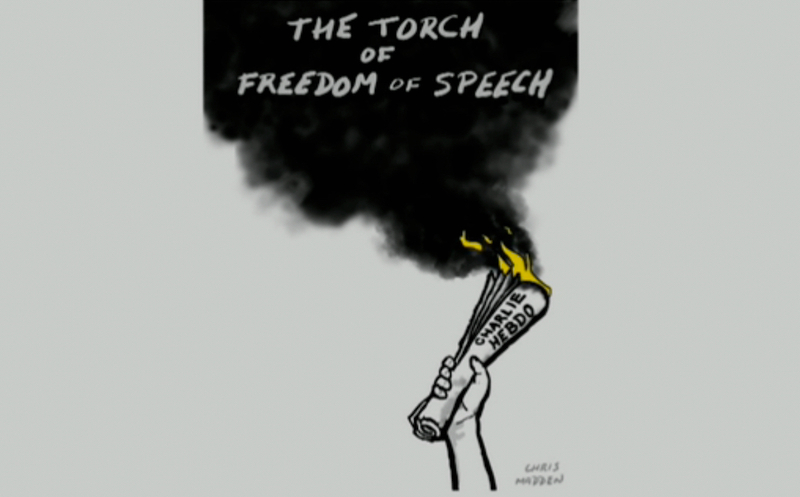 In solidarity with Charlie Hebdo and underlining the freedom of speech French-German TV Channel Arte published on its website a short film on perspectives of cartoonists from various countries. Connected to that a world map illustrates how freedom of speech is being represented through cartoons.